A simple trip to the Google Play Store reveals an abundance of available photo and editing apps, but it isn’t always easy to find the best of the bunch. To help, we sifted through the sea of available programs and apps and we’ve came up with one to introduce you with today. The photo editing app we’ve discovered is called Snap Photo Editor Pro Stickers, requiring Android 3.0 and compatible with both phones and tablets. It is user friendly, organized, with amazing design and multiple fun features to improve your photos and make them gain more likes and followers. This Android app allows you to add stickers and text to your photos, making them look better within few taps. Just add the photo from your gallery that you want to edit or use the app’s built-in camera button. 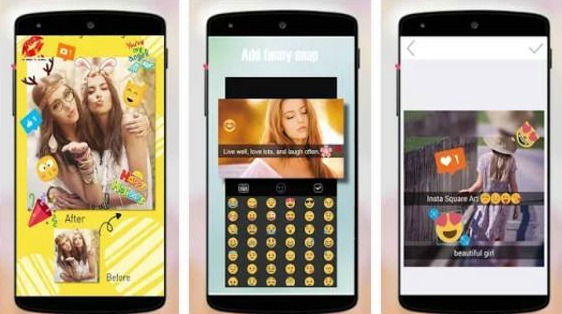 Then, search through the enormous list of stickers (smileys, anime eyes, animal stickers, love stickers, hearts, kisses, flowers, tears, and many more), write text and choose its font and colors. Anything you add on your photos is customizable, meaning you can zoom in, zoom out, rotate left, rotate right, etc. The developers try hard to keep up with the latest trends so your stickers are usually up to date. With more features coming soon, the Snap Photo Editor Pro Stickers can be downloaded for free from Google Play! Share your creations via e-mail, via Facebook, Instagram, or other social media page you’re using or save them in your gallery!